We got back home again yesterday in the late morning after two days away working. By coincidence we both had gigs an hour away from each other, Fritz in central Connecticut, I in central Massachusetts. We stayed with a great friend of ours just northeast of Hartford and had a really fun mix of good food, good talk and introducing Fritz to three episodes of Family Guy on DVD. The second and last Symposium in Greenfield was a big success and it looks like I’ll be back here again next year, possibly for a two- or maybe even three-day study of Richard Wagner; expanding to three days for Wagner, who is such a huge topic, was raised as a possibility. We’ll see where it all goes. The people there are lovely to work with and I like the program immensely. The title I proposed would be “Richard Wagner: the troubling genius who changed everything.” We’ll see what happens. 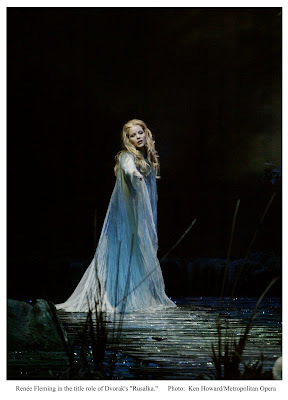 Tonight brings my “Week of the Two Rusalkas” to a close. Antonin Dvorak’s opera Rusalka is based on the same myth that became Anouilh’s Ondine and Disney’s The Little Mermaid. Since it descends from the Slavic tradition, there’s a real kick to the story—no happy ending a la Disney and the consequences for Rusalka (a rusalka in Czech is a wave in a lake or river that flashes and glitters in the moonlight) once she fails to connect successfully with the human world are not pleasant. The music, however is gorgeous, fully mature Dvorak at the height of his powers. I saw the Metropolitan Opera’s production (four the fourth time—I dearly love this work) last Friday night with Renee Fleming for whom it has become a signature role. The sets and costumes were ultra-realistic in an Arthur Rackham-illustrated storybook style. This evening the Boston Lyric Opera presents the opera in what publicity shots in the papers indicate may be somewhat more stylized vision of the action. Soprano Marquita Lister is featured as Rusalka, remembered in Boston particularly for a beautifully sung, totally uninhibited Salome several seasons ago. Earlier in the week I said to Fritz, “don’t forget I have a performance in Boston Friday night.” He asked what it was and I said Rusalka. No, he replied I had just seen Rusalka LAST Friday night. I told him I was seeing it again in Boston Lyric Opera’s production. Seeing it twice in the same week boggled him a little, but I know that with two different casts and two different productions it will, in effect, be a different opera. I'm not certain I convinced him, but my father didn’t get it either when I was growing up. It was Mozart's Don Giovanni for me back then. Ted, or TED as his comment is headed (I always think of Ted as a larger than life personality) asked for a comment on Ms. Fleming's performance. I've seen her in the role three times now, and find that her involvement in the character is deeper each time. Having become human for the love of the Prince, she finds that actually maintaining a relationship with him is somehow beyond her emotional capacities. She wants to communicate but, having been deprived of her voice in exchange for a real body and mobility on land, she is unable and he is attracted elsewhere. It requires a good actress to spend the bulk of the second act silent in an opera, and she was heartbreaking in her attempts to reach him. Fleming turned fifty during the early part of the run but there's not even a fleck of dust on her vocal cords; the sound is rich, even sumptuous as always, and the opalescent high notes that make her a great Strauss soprano spun out effortlessly. Age frequently warms and fills in a lyric soprano's lower notes and that seems to have happened for Fleming, who was very assured in dramatic descents into the lower register. But the top remains unchanged, strikingly beautiful and the overall impression is of a voice in its prime. A couple of tenors over the years haven't been up to this soprano, but Latvian Alexanders Antonenko had a big success in his debut on the opening night of the run. He's definitely a dramatic tenor, an endangered species these days. The voice has a dark, rich color and the high notes are pretty secure if not yet under ideal control. At one point, though, he executed a perfect dimimuendo on a high note from double forte down to about double piano and that indicates a pretty good technique. The audience loved him, as they did Stephanie Blythe's Jezibaba, the forest witch who is the medium for Rusalka's transformation. Blythe's huge mezzo rang out impressively and she looked and sounded like she was having the time of her life in the role (reminding me delightfully of the superb animation production number Disney did for Pat Carroll's Sea Witch in Little Mermaid). Czech conductor Jiri Belohlaveck led a spirited, beautifully reading of the score. Your fascination with damnation would be troubling for many people, but I reckon it's a good trait in an opera queen. I noticed that you didn't comment on Ms. Fleming's performance. It's a shame (unless she didn't sound the way she usually does) they aren't doing a simulcast. I wouldn't have time to see it right now, and that would be vexing, but it'd come out on DVD, and that would be cool. That's an amazing photo of Renee Fleming! Once, when climbing the Spilberk hill in Brno, I saw a man walking in front of me in a bizarre costume. My Czech companion that evening explained that he was dressed as Vodník!